Minolta SR/MC/MD- what counts for registration distance? 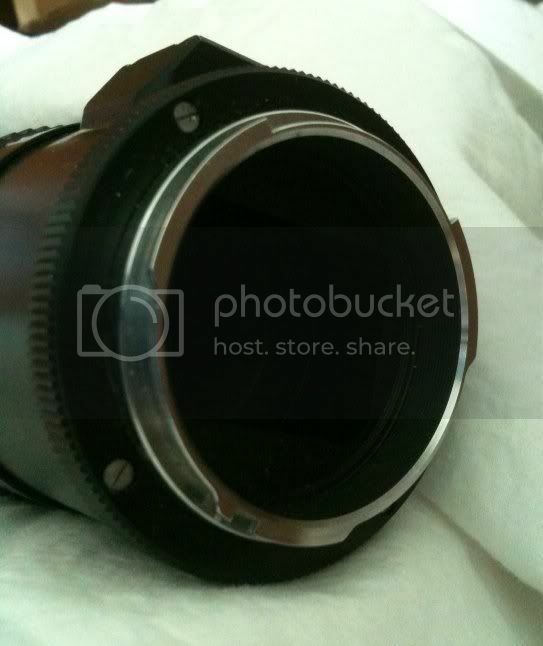 Posted: Sun Apr 04, 2010 3:59 am Post subject: Minolta SR/MC/MD- what counts for registration distance? 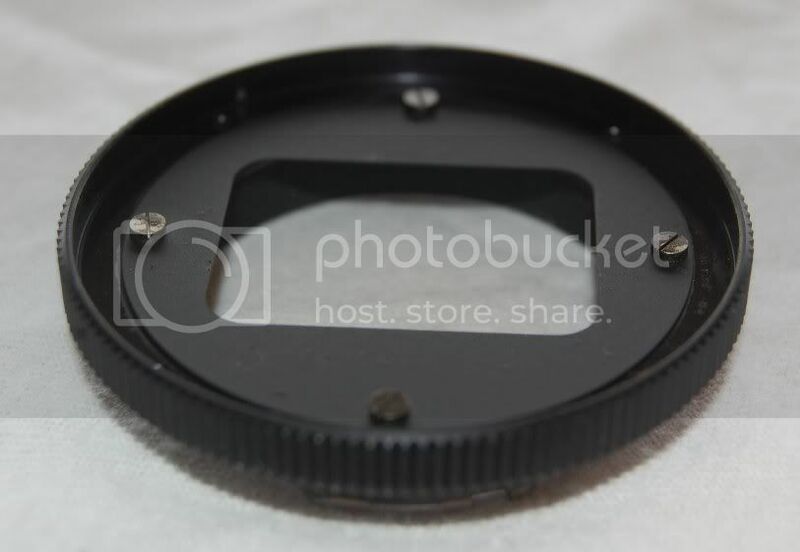 I've read that the Minolta SR/MC/MD registration distance is 43.5 mm at the flange, but can anyone tell me just where that flange is on my lens? Is the flange that counts the machined part of the silver part, just behind the bayonet tabs? Or is it the black flange? The black flange meets the surface of the outside of the cameramount. So the 43.5mm would be measured to the black flange then? Rats. I was hoping it was the other way around. This news will make my mount conversion more difficult. It looks like a preset lens. So is the SR/MC mount on it a T2 adapter that you can change for another T2? That's really not difficult and they are easy to get. 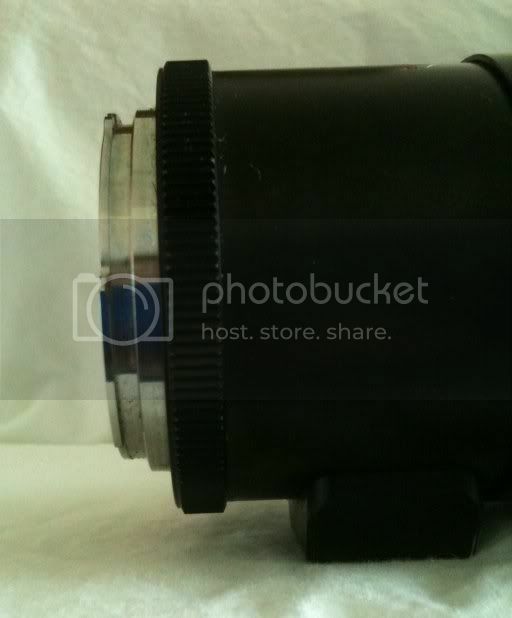 Here's a photo of a similar lens from an ebay auction, which is better than any photos I have at the moment as mine is in the mail. So yeah, I haven't taken it apart yet, but I'm hoping that the rear end of the lens comes apart nicely. By that, I mean that I hope a fair amount of it comes off, as I need to effectively shorten the lens to make it focus to infinity with a Nikon mount. Sorry about my hopefull suggestion. I didn't reckon the lens as a Rokkor. 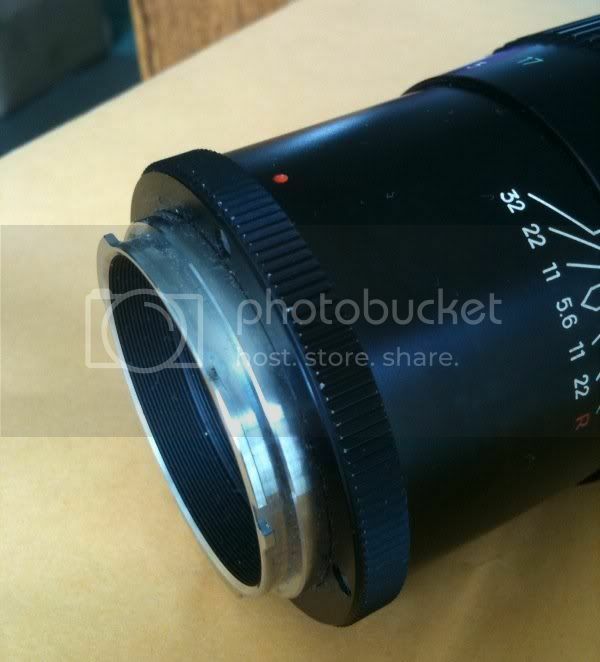 You are right, Minolta did not make lenses with T2 adapters. The measurement is called camera register -- the distance from front surface of mount on camera to the film plane. Interesting project here. Hope the mount removes easily. Looks like a recessed rear element so the tube can be shortened, maybe even to T-mount length, other mount installed. Yep, that's what I'm hoping too. I only need to shorten it about 3mm.. which I think would put the Nikon mount just a touch further in than where the rectangle light baffle is at right now. 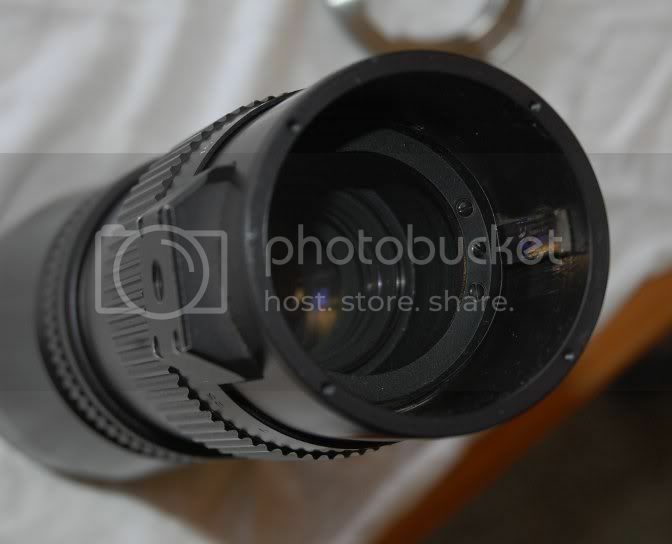 I'm hoping that the silver mount, the black knurled ring, and the light baffle are all just sandwiched onto the rear of the lens tube with the same screws and all come off nicely. It looks like your lens mount attachment is much simpler than mine. You are right, I have to fix the stop down/auto linkage to manual. I think there's enough clearance for the rear element. I looked at several sites on the conversion including Koji's. I've got the mount off and am grinding the 0.5mm or so off and then by trial and error, putting it flush on a M42->EOS adapter to see if I got infinity focus. Slowly but surely will get there. Thanks, and same to you! Do you happen to have a "build thread" for your conversion? I would be interested to see how it is coming together. Sorry, just some notes and quick photos on how to put things back together. Now that you mention mirror clearance, I will need to check that before going any further, unless I plan on using it on my Canon 500D only. Dayum! I had the mount sanded down almost getting infinity focus and I did a test mount and fired off a shot with my 5DM2, the mirror was held up and did not return upon taking the shot X-( Still a little bit more to go, looks like this will be a lens for my 500D as I don't want to shave the mirror on my 5DM2. On the 5DMk2, couldn't you still use the lens if you lock the mirror up and focus/shoot in the live view mode? 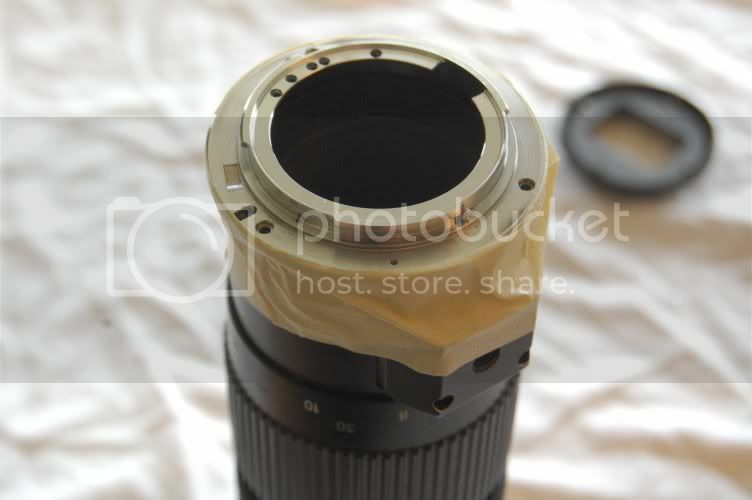 Ok, so I received my lens and took the mount off. Unfortunately, it is constructed differently than I had hoped. The mount that came off is actually quite thin, and was hollowed out to sit over the end of the tube, not a thick spacer like I had hoped. 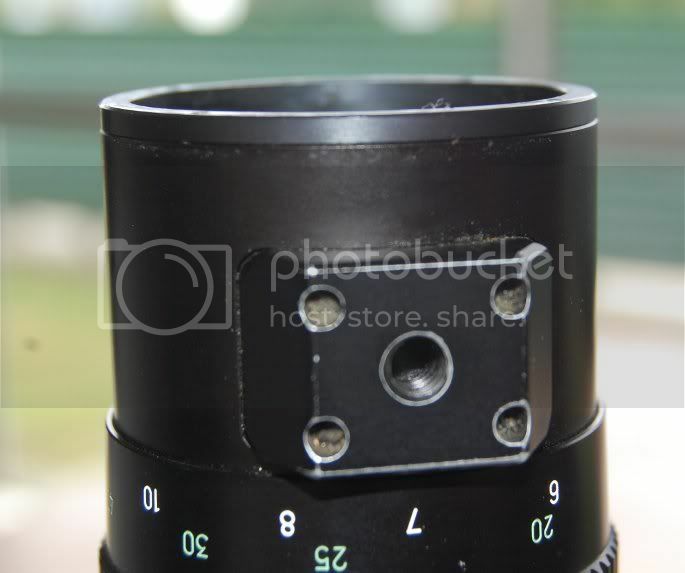 When we look at the back of the lens, it appear to be made of two pieces, with an inner tube that is pressed into an outer tube. The threaded screw holes are in the "inner" piece, which has a short flange at the top, so any removal of material from the lens barrel will mean that I will lose the screw holes... making it harder to attach another mount. I also found that the barrel was smaller in diameter than most of my other lenses, so I didn't have any Nikon mount plates small enough to mount very well. Nevertheless, I was determined to test this lens. Aside from not being able to focus to infinity, I was actually pretty impressed with this lens! Sharpness was very good considering my setup, and the light weight and compact size made it seem like a lens that you could walk around with and use handheld without any problems. Well, assuming that it isn't just held on with masking tape.